I started by die-cutting one of my favourite leaf dies out of black. I pressed it into my versamark pad and dipped it into my container of Gold Tinsel embossing powder. I didn't cover the whole sprig, but most of it. I placed the leaf on a hot plate to melt the embossing powder, but I could have easily just used my heat tool. :) Once it had cooled a little, but was still warm, I pressed on a few gilding flakes. I wanted to seal in the flakes, so placed the leaf back on my hot plate (again, a heat tool would work as well). Sprinkled over top to cover the whole sprig with UTEE (ultra thick embossing enamel). It melted, sealed everything and gave some dimension to the leaves. So pretty! I placed it over a background piece that I had repeat stamped a leaf image in Versamark. I sprinkled a little pearl coloured Perfect Pearls over top and used a soft brush to brush it over the background. It sticks to the Versamark to create a very soft and subtle background. 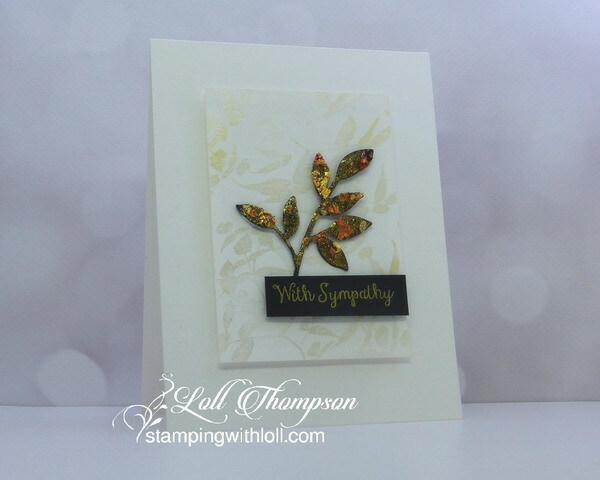 The panel was popped up on the card front, and a gold heat embossed black sentiment banner was popped up on top, catching the end of the leaf sprig to hold it in place. A few more small pieces of pop dots were added to a couple of the leaves to secure it all. I hope you'll check out the challenge blog to see the amazing inspiration cards from our talented Designers and our Guest Designer, Jane (Purplejet Loves Crafts). Hope to see you in the gallery! Oh wow.. what a beauty, not just the leaves but the perfect pearl background too..looks gorgeous! Loved this technique and am inspired to try it. love this Loll...heat plate is such a good idea - deifinitely going to give this a go!. 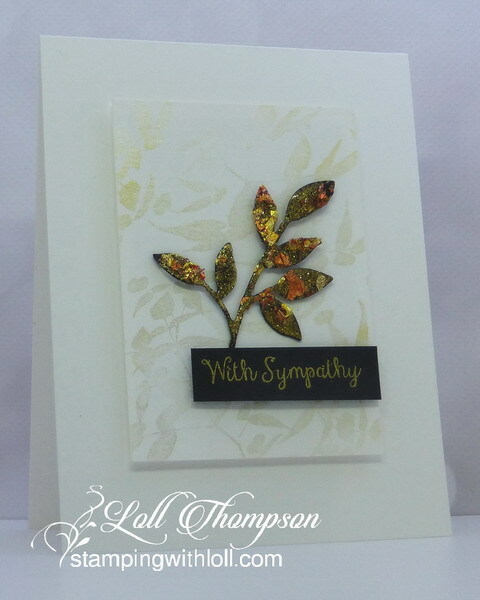 Using the black die cut makes such a classy leaf sprig! Love, love, love the gilding flakes and shine! Love that background too! That's a technique I haven't tried and have all the stuff to do it. Thanks for the inspiration, my friend! Divine card, Loll! I love what you did with the leaf sprig. Looks like gilding under glass. So, so,pretty! So beautiful - love the richness of the die cut leaf and the softness of the Perfect Pearls background! Great challenge this month! Oh what a stunning card Loll - love the multi layered sprig of leaves, and the subtle perfect pearls background is the perfect background. What a beautifully detailed embossed die cut. So much interest there. 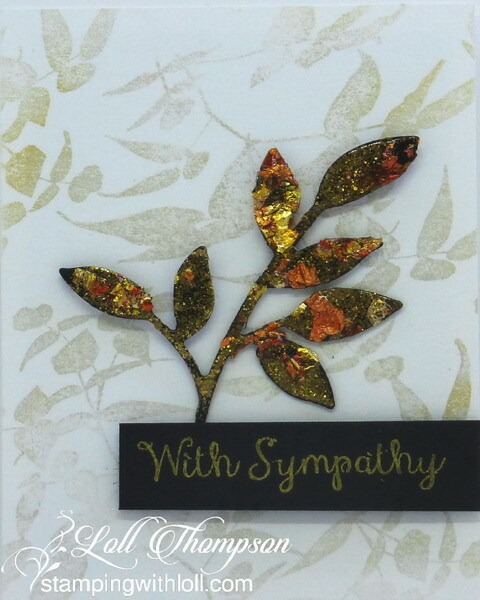 It helps set off your lovely and elegant sympathy card. Wonderful work. I am curious as to your using a hot plate over the heat tool. I've not heard of doing that. Thanks so much for sharing and have a lovely weekend! This is stunning. What a fun technique this sounds like. I so happy to have you as a new follower on my blog. I love coming here and have learned so much from you. This is a new thing I must try and I have to be gone today or I would jump right in. What an incredible effect and unusual combination of media! The effects are remarkable. I have no idea how you think of things like this but love seeing the results. I must get a hot plate now! This is fantastic! Incredibly precious, those gilded flakes add such richness along with that extra coat of UTEE. In just doesn't get better than that. The softness of your little frame perfectly compliments this beauty. Stunning Loll, bravo! This card is so elegant. Your twig looks stunning, Loll. Your subtle background is perfect to showcase that stunning die cut! Absolutely love this card! Beautiful card and embellishment! Thanks for the how to! 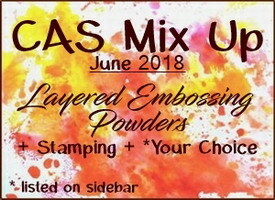 Here I am just commenting on June's CAS Mix-up. It was a fun technique and your leaf is incredible, Loll.